The molecule known as H3+ is believed to have had a vital role in cooling down the first stars of the universe, and may still play an important part in the formation of current stars. 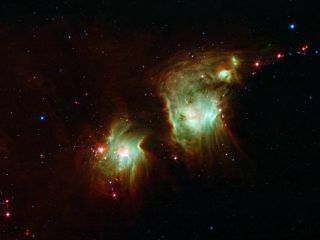 Above, new stars burst into being in the star-forming nebula Messier 78, imaged by NASA's Spitzer Space Telescope. LONG BEACH, Calif. — Astronomers have found tentative traces of a precursor chemical to the building blocks of life near a star-forming region about 1,000 light-years from Earth. The signal from the molecule, hydroxylamine, which is made up of atoms of nitrogen, hydrogen and oxygen, still needs to be verified. But, if confirmed, it would mean scientists had found a chemical that could potentially seed life on other worlds, and may have played a role in life's origin on our home planet 3.7 billion years ago. The findings were presented Jan. 9 at the 221st annual meeting of the American Astronomical Society. "It's very exciting," said Stefanie Milam, an astrochemist at NASA Goddard Space Flight Center in Greenbelt, Md., who was not involved in the study. If the findings can be verified, "this will be the first detection of this new molecule. It gives us a lot of hope for prebiotic chemistry in this particular region." So while life may have emerged from hydrothermal vents on Earth — a theory that many scientists support — the molecules that eventually transformed into the earliest life forms had to come from somewhere, and that "somewhere" may have been space. To test this theory, astronomers look for the chemical fingerprints of simple, inorganic compounds forming in interstellar clouds. These compounds aren't life or even carbon-based, but they can react with other molecules to form some of the building blocks of life, such as amino acids or the nucleotides that make up DNA. In recent years, scientists have found several different prebiotic molecules in space, said Brett McGuire, doctoral candidate in chemistry and chemical engineering at the California Institute of Technology. In the hunt for these molecules, Remijan and colleagues scanned a star-forming region of the Milky Way called L1157-B1 using the Combined Array for Research in Millimeter-wave Astronomy (CARMA). They found a very weak signal of hydroxylamine, which makes sense since, inside L1157-B1, a violent gas jet is slamming into the interstellar medium; the shock from this gas outflow would be sufficient force to trigger these chemical reactions in the otherwise frigid depths of an interstellar cloud. The result: hydroxylamine. In turn, hydroxylamine could react with other compounds, such as acetic acid, to form amino acids that could be dumped onto other worlds during space-rock collisions. "We have some very preliminary evidence of its detection, a very weak signal that kind of looks like a line," McGuire told LiveScience. The signal is extremely faint and doesn't definitively confirm the presence of hydroxylamine. But the signal does seem to come from the right region, McGuire said. The findings are exciting, but they are not yet a definitive chemical signature of hydroxylamine, Milam told LiveScience. "Every molecule has a fingerprint, and basically what he's presented is the thumb print. So we need all the other fingers to confirm that this is the actual molecule." To confirm the finding, Remijan's team will keep probing the star-forming region for more signals that could confirm what they're seeing isn't coming from some other chemicals, Milam said. This story was provided by LiveScience, a sister site to SPACE.com. Follow LiveScience on Twitter @livescience. We're also on Facebook &Google+.